In a candid conversation with People Matters, Guruprasad Gaonkar, APAC SaaS Leader – Office of Finance (ERP) & Digital Supply Chain, Oracle shares his insights on digital transformation success at organizations in Asia, the trends and embedded capabilities in SaaS, and Oracle’s future outlook. Guruprasad Gaonkar holds the responsibility of Oracle’s Digital transformation orchestration across industries for the Office of Finance (CFO), Operations (COO), Information Technology (CIO) and Digital Supply Chain. He heads the ERP and Digital Supply Chain teams for Asia Pacific markets namely Australia & New Zealand, Southeast Asia and India. 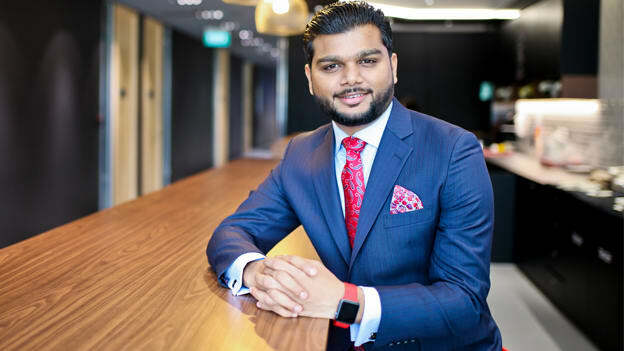 Prior to joining Oracle, Guruprasad spent nearly two decades in international executive roles, management consulting and advisory roles across Asia-Pacific, Europe, Africa and Latin America. When it comes to digital transformation and technology, how are Asian organizations operating differently than organizations operating in the developed markets? Firstly, digital transformation is defining what tomorrow looks like. The idea of ‘tomorrow’ is no surprise for people, as all of us here spend a lot of our time figuring this out. For enterprises across Asia-Pacific though, waking up to a drastically different possibility of tomorrow has been a challenge in the last few years. There are the four pillars that every organization across the Asia Pacific are looking at —, the first thing that is top of mind is the future of work and what it would look like? Secondly, how supply chains will be transformed? Third, what are the changing expectations from finance as a function? And finally the most important, on how do we make customers experience better? These are obviously underpinned by the digital technologies that are enabling them, and this necessitates the call for greater focus on digital because businesses in Asia have never been as digital as they are today. There are several positives in Asia including consumer openness to new technologies, spread of the mobile internet and social media penetration. However, there are also contrasting factors in regulatory environment and concerns related to cybersecurity, thereby willingness by companies to innovate that make the impact on digital readiness more striking in one market than in other. Asia thought has a brilliant business ecosystem but there’s always scope for learning from other “digitally developed” markets in terms of what and how they offer, and the boldness of integrating new business systems. What are the regional variations when you execute digital transformation journeys for your clients? The business models of organizations are usually market-centric that they operate in. The primary focus is on personalization and user experience, product diversification cost efficiency, automation and innovation. The pace of change is exponential in all our markets hence the key question being asked – is the ability of the organizations to respond to this change quickly. We see cloud is fast becoming the foundation for digital transformation. Digital native organizations are the first ones to adopt. There are however variations across industries and in the way organizations are dealing with digital transformation and cloud adoption. In the banking industry for example, adoption of new technology consumption models (especially SaaS) is fast translating into staying up-to-date on the evolving compliance and regulatory changes. Australia, Singapore and Thailand are very forward-looking markets as many banks and insurance companies moving many of their back-office processes to the cloud for agility in business operations while also stay compliant with evolving regulations. We also experience significant traction in India across the board for cloud adoption, while there are challenges especially in regulated industries such as banking and insurance. What do you think works or doesn’t work when it comes to digital transformation success? Digital transformation is not a project, it is a board mandate. What we have seen works well is when organizations have a board mandate on digital - started to guide management by asking the right questions about technology. Most successful organizations have already taken a broader approach and maintain focus on business outcomes that they want to achieve from digital transformation rather than a silo IT approach. And more and more organizations are now taking an outcome-driven transformation approach. For example, digital transformation in workforce management translates into an intense focus on the Line-of-Business HR i.e high organizational level of Digital IQ that understands, harnesses and applies those new opportunities towards creation of the workplace of the future. Similarly, with office of finance, CFO functions are able to fundamentally move from being “transaction” support in the past to “decision” support. This is enabling CFO’s become advisers to the CEOs and directly influence decisions. What we have seen not working well are mostly the internal elements rather than external. Organizations that are not willing to experiment, push back on certain digital initiatives because there is resistance for change - based on what they are used to. This slows down transformation of any kind in general. Organizations need to adopt the process of continuously refreshing skills — either up-skill or refresh skills in order to embrace digital transformation. It is also about role definition. If one is measuring the success of a particular role on the matrix laid down in the past, it does not benefit from digital transformation. What do you think organizations are doing to manage such challenges and what is your advice to the HR leaders or community who usually leads such transformations in organizations? For HR leaders, there has never been a better time before, to define what future of work means for their organizations. Time is now, and the CHRO has the most important role in the organization to drive an impact on business. Technology is fast becoming the core foundational enabler but you obviously need a change agent to facilitate that improvement. If you look at the role of a CHRO today and in terms of how strategy at the board gets translated to the employees, there is a “strategic” gap. For example, diversity and inclusion is a board agenda of many organizations, but it doesn’t really get translated it into every department. There are gaps between what strategy is, and the way it is executed. This is where there is an opportunity for CHROs to translate the board strategy into execution putting the wheels in motion by employing technology as the foundational enabler. From an HCM perspective, can you share some use cases of how technology and embedded capabilities have benefitted organizations in the talent space? Union Bank in the Philippines is a classic example with the focus on aligning business goals to performance. Oracle HCM Cloud enabled relentless automation of many processes and today empowers employees at the bank the freedom over managing their own career development and performance in alignment with organizational goals. As a result, more engaged and enthusiastic employees deliver even better services to their customers. Second example is UST Global, a global provider of technology and innovation services across 25 different countries. Oracle cloud solutions help improve efficiencies and let employees perform the same tasks with 20 - 40 percent less time. To accelerate innovation, improve productivity, and successfully prepare for the future of work, HR can no longer make this trade-off. Instead, HR teams need simple and powerful solutions that combine an intuitive user experience with the latest innovations in areas such as chatbots and artificial intelligence. The new AI and user experience enhancements within Oracle HCM Cloud are powerful innovations that greatly benefit organizations. Many other organizations are adopting chat-bots as well. Where do you think SaaS is heading and what are the customer expectations from a technology company like Oracle in the coming future? Customers expect more and more to help deliver outcomes. The growing prevalence of Oracle subscription business models and next-generation technologies is fuelling large-scale digital transformations to make our customers more productive, smarter, and faster. Therefore, moving to Oracle SaaS has become more of a “when” choice than an “If”. And the biggest driver for that shift is Oracle SaaS’s ability to deliver more relevant innovation, much faster. Oracle SaaS today has both the broadest and the deepest capabilities whether it is for Customer Experience, HR, Finance or Supply Chain. For Oracle SaaS Customers these translate into three main things: firstly it’s the Speed, agility and to be able to drive business outcomes – be it in HR, Finance, Supply Chain or Customer experience. Secondly to completely eliminate complexity that came with traditional organizational structures and procedures. Thirdly, access to sophisticated tools and embedded innovations such as AI, IoT, blockchain etc to drive business value.